Jay and Don met on an organized trek in November, 2009 and each came with the purpose of having an adventure of a lifetime augmented with doing service work while in country and continuing that service work after leaving the country. The first three weeks were spent traveling from Kathmandu to Lukla and then trekking north with eight others, led by a Sherpa guide and assisted by porters. We traveled from lodge to lodge, slowly making our way to our northern destination, Gokyo Ri, an 18,000 foot summit located in the ‘shadows’ of Mt. 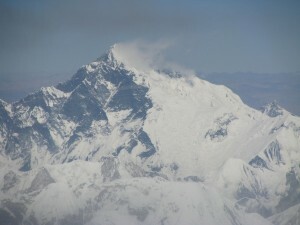 Everest and other of the world’s highest peaks. From there, we trekked south to Chhulemu, the home town of our Sherpa guide, where we spent a couple nights before ending the official part of our three week trek in Phaplu. The rest of our group flew back to Kathmandu, but Jay and Don trekked back to Chhulemu for a week to take on a couple of service projects we had defined. First, we designed playground equipment for the elementary school in Chhulemu, where a volleyball net and ball had been the only form of recreation for the students. We hired a local carpenter to build three steps up and down, two balance beams, two chin-up bars, a rolled up bamboo mat to become a tunnel, a teeter totter, monkey bar and a sand box. The kids, teachers, headmaster and parents all loved it! Each of the classrooms in this school was without heat and lacked much in the way of natural sunlight. The headmaster had requested wood or kerosene heaters be purchased and installed in the classrooms. Instead, having seen this in the Nunthala school, we suggested installing skylights in each classroom, the headmaster’s office and the apartments for the onsite teachers. These southern exposed skylights accomplished several purposes. They provided more natural light, adequate radiant heat and by avoiding the cost of installation of stoves, there is no need for trekking in costly kerosene, nor the need to cut wood, which would have contributed to the ever increasing problem of deforestation in the country. We ordered the skylights and arranged for their portering in and installation, all of which happened following our departure. 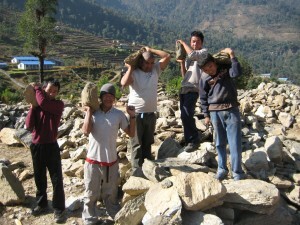 At the Nunthala school we hired local porters to remove rubble from the soccer field which had been left from a construction project. We also spent many hours with the headmaster and teachers in that school, learning what is needed to improve the quality of education. The list is long. What impressed us most was the dedication of everyone at the schools, from the headmasters and teachers to the students. We stayed at a lodge in Nunthala one night and watched as two sisters, daughters of the lodge owners, staked out a table beneath a lone naked dim light bulb and worked on their homework well past 10:00 when we retired for the evening. The teachers are deeply committed to their craft even though they are paid poorly and live very humbly. And the headmasters work tirelessly, making the most of limited resources because they know the critical role they play in developing young minds hungry for a better way of living. We committed to the headmasters we would do all we could to assist them in their vital positions. 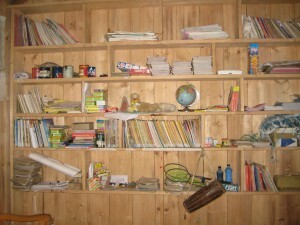 At one point we asked the headmaster of the Nunthala school to show us the school’s library. It was a small room under lock and key, containing a few volumes. It also housed the science lab—a few antiquated pieces of equipment in a tiny cupboard. He also told us the school could use more computers for their very small computer lab. Beyond the schools, Jay and Don learned that the overarching need in Taksindu and Chhulemu is electricity. Currently, the village is supplied with enough electricity to power one light bulb per household. What is needed is sufficient electricity upon which to cook, all of which is currently done on open wood burning fires. 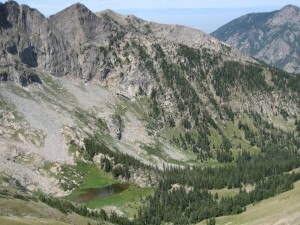 This creates unhealthy air to breathe and a never ending contribution to the deforestation problem mentioned elsewhere. Because of adequate rainfall and hilly terrain, there is ample water flowing from natural springs which could be tapped to provide additional hydroelectricity. 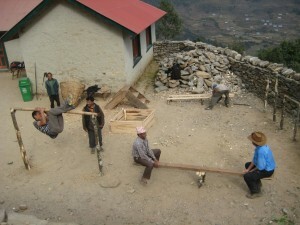 Exploring ways to build and fund this hydroelectric project became the primary focus of Jay and Don upon returning from Nepal. While it remains high on their list and the list of the HDF, initial research suggests it will take significant time and resources to become a reality. Accordingly, it remains a high priority of HDF, but is viewed as one that is long term in nature.